Today the Nederlandse Tuinbouwraad (NTR) announced the city of Almere as the location for the Floriade 2022 horticultural expo in the Netherlands. In preparation for the upcoming expo, the city will transform itself into green garden paradise according to plans designed by MVRDV. The expo site will be created as a permanent extension of the city center that will be rooted in sustainability and ecology - MVRDV and Almere promise that Floriade 2022 will be 300% greener than any other expo. As the current Floriade 2012 expo wraps up in Venlo, Almere and MVRDV are excited to begin with their plans for the next expo site, which will be the greenest event yet. Almere, which is a suburb of Amsterdam to the northwest, is a burgeoning city that will need 60,000 new homes in the next decade. MVRDV combined plans for the expo site and the city’s need for new housing to create the masterplan for Floriade 2022. Unlike some of the other expo sites, the upcoming one in Almere will be a permanent addition to the city, providing much needed housing, infrastructure, green space and other amenities. MVRDV plan for the expo organizes the site as a grid of gardens on a 45ha square shaped peninsula. Included in the design are a variety of programs such as a university, hotel, marina, offices, and homes. For the expo, each block will be dedicated to different plants and conceived as a giant plant library. To meet the goal of improving sustainability by 300% from past expos, the new green city will produce its own food and energy. Both urban and filled with plants, the expo could be billed as the ideal city. MVRDV and Almere beat out Boskoop with OMA/Rem Koolhaas, Groningen with West 8 and Amsterdam Bijlmer with MTD Landscape Architect to win the bid for the upcoming expo. 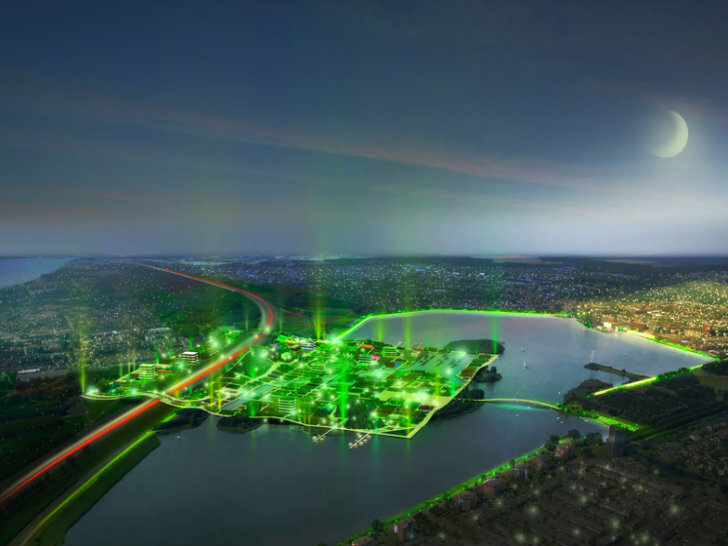 As the current Floriade 2012 expo wraps up in Venlo, Almere and MVRDV are excited to begin with their plans for the next expo site, which will be the greenest event yet. Almere, which is a suburb of Amsterdam to the northwest, is a burgeoning city that will need 60,000 new homes in the next decade. MVRDV combined plans for the expo site and the city's need for new housing to create the masterplan for Floriade 2022. Unlike some of the other expo sites, the upcoming one in Almere will be a permanent addition to the city, providing much needed housing, infrastructure, green space and other amenities. As the current Floriade 2012 expo wraps up in Venlo, Almere and MVRDV are excited to begin with their plans for the next expo site, which will be the greenest event yet. Almere, which is a suburb of Amsterdam to the northwest, is a burgeoning city that will need 60,000 new homes in the next decade. MVRDV combined plans for the expo site and the city's need for new housing to create the masterplan for Floriade 2022. Unlike some of the other expo sites, the upcoming one in Almere will be a permanent addition to the city, providing much needed housing, infrastructure, green space and other amenities. MVRDV plan for the expo organizes the site as a grid of gardens on a 45ha square shaped peninsula. Included in the design are a variety of programs such as a university, hotel, marina, offices, and homes. For the expo, each block will be dedicated to different plants and conceived as a giant plant library. To meet the goal of improving sustainability by 300% from past expos, the new green city will produce its own food and energy. 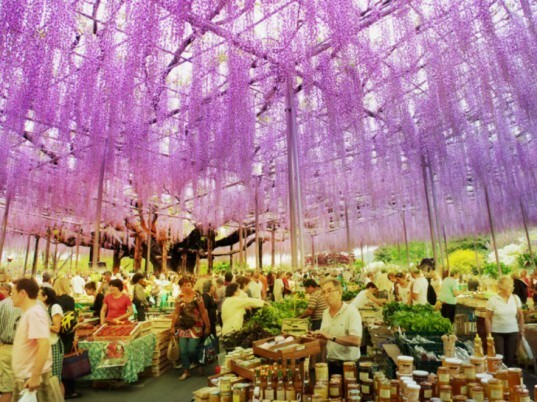 Both urban and filled with plants, the expo could be billed as the ideal city. MVRDV and Almere beat out Boskoop with OMA/Rem Koolhaas, Groningen with West 8 and Amsterdam Bijlmer with MTD Landscape Architect to win the bid for the upcoming expo.